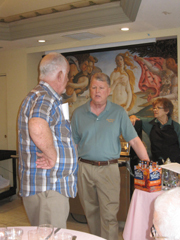 Craft Beer Events - in South Florida and Western North Carolina. Beer Tastings, Corporate Beer Events. 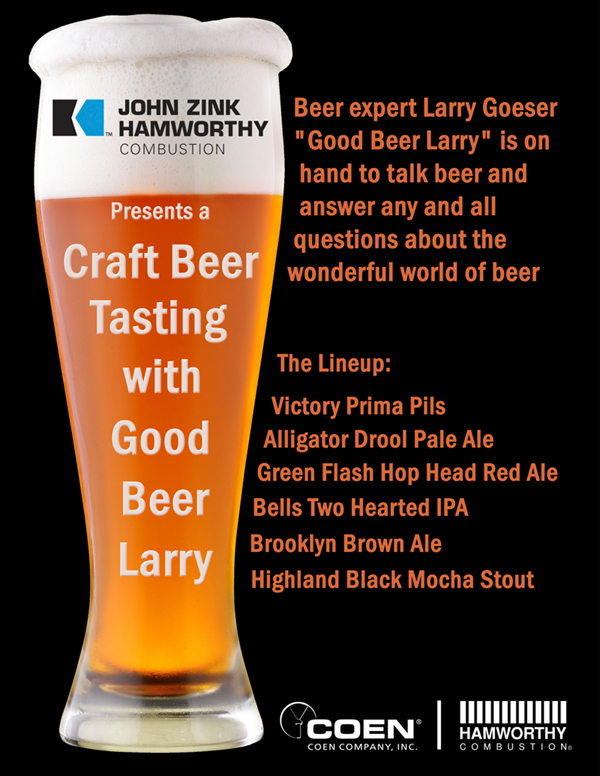 Beer Tasting Extraordinaire Good Beer Larry can make your event fun and informational. Beer Enthusiasts from all over come to these events to learn and try new craft beers. Contact us today to set up your own Craft Beer Event. We offer a variety of craft beer events. From small private affairs to coprorate events at larger clubs or hotels. The tastings vary from a standard light beer to darker / stronger beer tasting to an event with several beers of the same style. Regional or seasonal beer events are popular too. With the explosive growth in Florida craft breweries an all Floirda tasting is a great idea. The possibilities are almost unlimited for craft beer events. Below are several different types of craft beer events we offer; contact us today so we can start planning a great event for you today. Power Gen Conferance John Zink Hamworhty Craft Beer Table. Smaller Private Tastings: Let us help you plan your beer tasting event. At a recent event there were eight beers to taste along with appropriate snacks. The smaller in home events allow for flexibility and unique ideas. We meet with the host to make sure everything goes according to plan. Special requests can usually be accommodated. A special day or happening can be a great time to have a beer tasting. At every tasting we provide tasting sheets and pens to take notes on the beers tasted. These can be customized for the occasion. Other beer related handouts are available. Fun beer facts and figures are presented. Contact us to help you plan your beer tasting event today. Tastings at Local Restaurants and Beer Bars: We offer beer event services to local venues of many sizes. We have set up several that are now monthly events that patrons can count on each month. Other ideas are themed events; seasonal beer events and events highlighting the beers served at the bar. We can provided all beer related planning services. Custom tasting sheets are provided at all events. Different events may need other beer related handouts from our library of beer classes. With notice the event will be listed in our monthly e-newsletter which goes to local craft beer drinkers. E-mail services can be provided for any event; contact us for more information. Larger Private Tastings and Events: The same event ideas are available; the group or venue is larger. The beer tasting might be one of several 'bars' serving at a large party / event. The tasting would be part of a continuing event within the larger event. Samples would be available for all beers; when a guest likes a beer they could get a regular serving of that beer and continue on to other areas of the party. Beer tasting related handouts would be available for those interested. We also can assist with e-mail blasts and other marketing tools for your event. Contact us for more information. Corporate Craft Beer Events: Your guests want to do something new and different after their day out or meetings. We will lead the presentation and present a complete beer tasting event for your guests. Written tasting sheets are provided as well as handouts, from our library, about a particular subject about beer. Craft beer is gaining in popularity and we present it in an interesting and fun way. 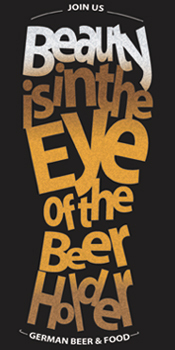 Our dedication and enthusiasm for craft beer will spread to the audience and everyone will have fun. The beer event will have everyone talking about it creating a 'buzz' about the hotel / club and event. Contact us today to start planning an event. The folks at John Zink Hamworthy Combustion wanted to do something different for their customer appreciation event. The event would take place on the last night of the Power Gen Conference held at the Rosen Hotel / Orlando Convention Center in Orlando Florida. The company does this each year and wanted more then the some old bar table and foods. Working with the hotel staff and the corporate group at John Zink a fun event was put together. 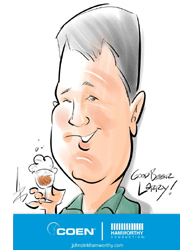 Six craft beers were brought in for the occasion and a caricature artist added to the fun. My table proved to be one of the most popular of all the groups presenting that night. It was set up with beer realted handouts and breweriana. There was plenty of beer available and great sampling glasses provided. The hotel provided a bartender to pour the beers and I stood outside with the customers and answered many questions about craft beer, it's history and the growth of the industry in general. All questions were answered satisfactorily and people left the table with new knowledge of craft beer. I also created the invitation and poster for the event. The caricature artist added to the fun; mine is to the left. Overall the event went well and it could be done again next year. 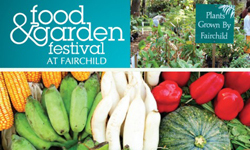 There are several photos on the GBL FB page and the event poster is HERE. This event was held at the Eggersmann USA showroom at DCOTA in Dania. The event was on 'Kitchen Day' when all the kitchen showrooms had special events. The theme was all things German; beer, foods and kitchens. Working together with the Eggersmann staff this event turned out great. There were over 15 different German beers; most paired with the various foods at the event. To start the event I gave a short history of German beer including mentioning Reinheitsgebot the German Beer Purity law. The law states that beer can only contain 4 ingredients: water, malted barley, (or wheat) hops and yeast. All the beers at the event were brewed following this law. There were 4 food items with several beers paired with each. Roast Beef and Horseradish on Brioche paired with Helles Lager and Pilsner. Veal Meatballs Beer Braised with Weissbier and Kolsh. German Sausage and Potato Skewers paired with Dunkel and Schwatrzbier. Black Forest Ham with apple Beer Butter paired with several Dopplebocks and Oktoberfest. Some favorite beers form the event: Weihenstephaner Helles, Schneider Edelweisse, Bischoff Black Lager, Spaten “Optimator” Dopplebock (with Ayinger "Celebrator" also enjoyed) and Spaten Oktoberfest. The Aecht Schienkerla Rauchbiers (smoked beers) interested many as well. Overall the event went well; people tried beers then came back for favorites later. The attendance was great and everyone had a good time. Eggersmann hopes to do something similar again. Event photos on my Facebook Page. View my original invitation and event page.